One of the more significant innovations in how we do business is unfolding around us with little to no fanfare. Perhaps it’s because this innovation has little to do with technology, software, or anything megabyte related. Rather, this innovation is all about how we collaborate in the workplace and how businesses are using this emerging trend to improve their product and strengthen customer relations. The old business model of a “command-control” hierarchy with employees working in isolation is quickly going the way of landlines, VCR’s and floppy disk drives. Today, more and more business leaders are seeing the value in having employees work together and share ideas. It seems the most effective workspaces are the ones where team-building is fostered and strengthened through collaboration. There can be no question effective collaboration amongst colleagues will only serve to grow and strengthen teamwork and their sense of cohesion. However, achieving effective collaboration is not as simple as sending a memo or email asking everyone to start working together. In fact, there is somewhat of a Catch-22 in the equation. You need collaboration for positive team-building but you can’t start the process of collaboration unless everyone feels like they are part of a team. One of the biggest mistakes business leaders make is expecting newly-formed teams or working groups to immediately accept the knowledge sharing approach. This often proves counter-productive as the group has not had the opportunity to get to know one another, develop trust, assess where everyone fits in the process, and get on the same page moving forward. A more effective way to kick-off a project would be with some team bonding activities, ideally outside the workplace to help facilitate this process. According to the Financial Post’s Seven Insights in Collaboration, collaboration is, first and foremost, a change in attitude and behaviour of people throughout an organisation. That means successful collaboration is a leadership issue – it starts at the top. To affect this change and make it permanent, senior management needs to put the right elements in place. It won’t come about simply by making a pronouncement or writing a mission statement. Building Trust – Creating a culture of open communication where it is encouraged to share ideas and thoughts without the fear of negative judgement or scepticism is the key to developing positive team collaboration. Build Relationships – A team that knows each other and can have fun with each other are more likely to collaborate than a team of strangers. Investing the time and resources into this one area will create a positive and happy work environment. This can be achieved through team building days and other social events. Group Diversity – By diversity we are not simply referring to demographic diversity (gender, age, ethnicity) although that should not be disregarded. Of equal importance is diversity within the organisation in terms of knowledge, experiences and skills. Experiments at the University of Michigan found that, when challenged with a difficult problem, groups composed of highly adept members performed worse than groups whose members had varying levels of skill and knowledge. The point here is, when you have a team that all think the same, share the same beliefs, have similar training and experiences etc, it can become a challenge for them to think outside the bubble of their world and really explore new and creative ways of doing things. Having The Right Tools & Support Materials – Inspiration can strike at any time. When it does, you want to make sure the group can capture the great ideas as the arise. That means ensuring your working group has access to laptops, white boards, technology and whatever else they might need to facilitate the brainstorming process. Food is also an important support material. Nobody is at their best when they are hungry. Creating an Open Space Environment – By having colleagues working in an open area workspace, there is a greater opportunity to share ideas and problem-solve. Often, an employee will simply overhear a co-worker’s issue and offer a solution which improves productivity and strengthens the culture. Size Matters ­– The best teamwork and collaboration will happen in groups of 4-8 people. Any less and you’re not getting enough voices in the mix and more than eight will undermine the sense of group intimacy and lead to the more introverted not contributing. Be Prepared for Conflict Resolution – A difference of opinion in any group discussion is inevitable and often people can develop bruised feelings if they feel their ideas are not fully appreciated. Have a strategy in place to resolve conflicts and make everyone feel like their input is valued even if all their suggestions are not adopted by the group. 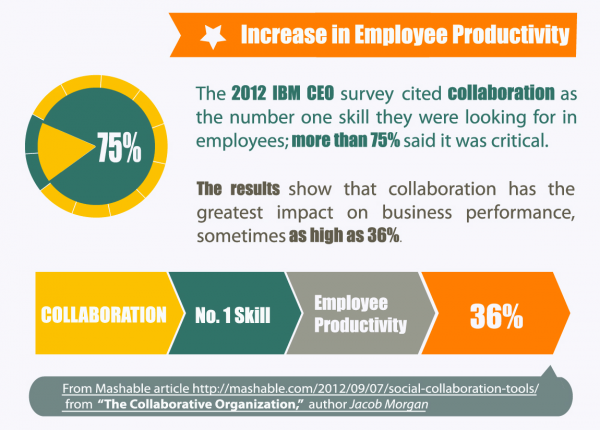 81% of workers believe there is a positive correlation between collaboration and innovation. Of those who contribute new ideas in the workplace, 72% are in a collaborative environment. 28% are not. More than half (54%) of those surveyed believe the best ideas come from free open exchanges with colleagues. 90% of work voice calls will originate from collaborative applications by 2020. The bottom line is a collaborative workplace where everyone is working together will improve operational efficiency and productivity. With even the slightest amount of analysis, it becomes glaringly obvious why – it saves managers from having to solve all the issues themselves and makes it easier for organisations to stay ahead of potential pitfalls. Often frontline workers can anticipate hazards better and faster than senior management. This is why 75% of CEO’s surveyed say the ability to work in a collaborative way is one of the most important qualities they look for in potential employees. They understand how important this can be for their business. One study estimates a collaborative work environment can increase bottom line profit by an estimated 36%. Team building and creating a sense of unity is integral to the long term success of any business or organisation. It is becoming increasingly clear that the best way to achieve this is by fostering collaboration within your culture and day to day operations. Don’t hesitate in restructuring your organisation. You’ll be amazed and what can be accomplished when a group of bright and dedicated people start working together and sharing their best ideas. Total Team Building have a range of programs that help foster collaboration in a fun and engaging way. If you would like more information about how we can help you, please give a call.